The fast automatic barriers, for openings of up to 2.5m, are the ideal solution for private or public car-parks in residential areas or in zones of high passage intensity. Easy to install, they come complete with a full range of assembly accessories such as various-section bars, lamps, racks, fixed supports. The G6000 models are suitable for industrial and high-intensity use passages. As in the other versions, the CAME automatic barriers are very carefully designed to ensure utmost reliability and specialist features suitable for the application context. The low-voltage operators and assembly structure make these products the ideal solution for controlling work passage areas or applications where fast, safe automation is necessary, for large passageways. • SELF PROGRAMMING of the radio code between transmitter and receiver. • AUTOMATIC CLOSURE: this intervenes automatically after the pre-set time (regulated on the dedicated trimmer). • AMPEROMETRIC DEVICE for obstacle detection (24V version). • “Maintained Action” COMMAND: provides for holding the pushbutton to obtain gate movement. • ADJUSTMENT OF THE MOVEMENT SPEED (24V version). • IMMEDIATE CLOSURE if obstacle detected (24V version). • “SLAVE” function: allows connection of paired barriers (24V version). • SELF-LEARNING of the radio code between transmitter and receiver. • AUTOMATIC CLOSURE: operates after the pre-set time on the dedicated trimmer. • OBSTACLE DETECTION WITH MOTOR OFF: this function allows the photocells to stop the barrier moving if they detect an obstacle, even with the motor off. • AMPEROMETRIC DEVICE for obstacle detection to achieve maximum (adjustable) sensitivity in the event of contact with foreign bodies. • “MAN PRESENT” CONTROL: means the pushbutton must be kept down for the gate to move. • SLOW DOWN DURING OPENING AND CLOSING to make the bar stop smoothly. 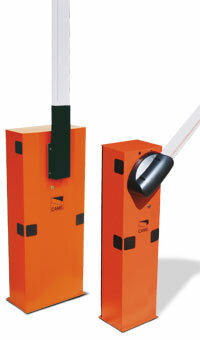 • IMMEDIATE CLOSURE IN THE EVENT OF OBSTACLE DETECTION to obtain maximum operation safety. The automation immediately sends the bar into reverse in the event of contact with an obstacle. • SAFETY ACCESSORIES CONNECTION for system integration with all the devices provided for by current automation standards. • MANOEUVRE SPEED ADJUSTMENT for adapting to effective passage requirements and achieving greatest system movement reliability. • “SLAVE” FUNCTION: for connecting two barriers. • INTEGRATION AND MODULARITY: photoelectric cells and command selectors are integrated with the automation, in perfect visual harmony. • EXCLUSIVE INCORPORATED FLASHING LAMP with a lighted LED diffuser. 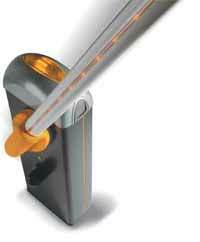 Combines design and modern lighting technology of illumination. • COMMAND ELECTRONICS positioned in a way to make any type of intervention particularly practical. • ANTI-SHEARING SECURITY mechanism in the point where the bar rotates. • SELF-MEMORIZATION of the radio code between the transmitter and the radio receiver. • ROUND TUBULAR BAR: for maximum reduction of the “sail” effect. 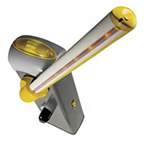 • SAFETY LIGHTS: an electronic contact cuts off the illumination voltage once the inspection door is opened. • ENCODER: for the electronic control of the movement in the version with a 230V motor. • SPRING WITH DIFFERENTIATED SENSITIVITY: For supreme balancing of the shafts. CAME GARD G2500 , G4000 G6000 barrier gate system. The CAME automatic barrier system G-2500: Fast road barrier specifically designed for control of passenger way up to 2.5 metres wide. The barrier requires only 2 seconds to open, thus providing rapid access. * Electromechanical gear motor: does not need periodic maintenance. * Not-reversible gear motor: die-cast all aluminum structure. * Powerful: designed to operate in especially heavy-duty cycles. * Self-locking: maximum security by keeping gate closed. * Key release mechanism: lock is interchangeable and compatible with other CAME appliances. Possibility to release the motor from outside by means of a handle and cable. Speed adjustment and deceleration adjustment in opening and closure; intensive use, possibility of battery back-up, obstacle detection: all these are characteristics by a DC. 24V automatic system. FOR FULL GARD 3, GARD 4 GARD8 AND GARD 12 BROCHURE PLEASE CLICK HERE.